More than a hundred people, ranging from engineers to biologists to filmmakers, came together to make this expedition happen. Members of the science team were on hand for the dives to provide analysis of never before collected samples and data from these depths, while engineers and crew members were on-site to make sure that everything went as planned. All together, the team boasts thousands of hours of deep-sea experience. An experienced diver and leader of seven previous deep-ocean expeditions, James Cameron was named a National Geographic explorer-in-residence in 2011. He is an Academy Award-winning director with a passion for exploration, having climbed into submersibles for more than 70 dives. Among these dives were several to the wreck of Titanic, which Cameron explored studiously before, during, and after making his Oscar-winning film about the ship. In connection with these and many other dives, he has produced several acclaimed underwater documentaries, including his first digitally shot IMAX 3-D film, Ghosts of the Abyss, in 2001. The opportunity to explore new frontiers and advance the limits of science has fueled his fascination with the mysteries of the underwater world. Traveling to the bottom of Challenger Deep was a long-term goal of his, and he hopes that his journey inspires others to embrace exploration and discovery too. Ron Allum developed the original submersible concept with Cameron. Allum, whose past includes a career as a broadcast engineer and years of cave diving, spent a year and a half creating the foam that’s a critical component of the sub. He and Cameron co-founded Acheron, a company dedicated to building the entirely new, full-ocean-depth submersible for human transport, documentation, and research. David Wotherspoon was Australian project manager/submersible operations director on the DEEPSEA CHALLENGE expedition. Prior to that, he worked as a senior consultant for Phaze Zero, and before that he had a varied military career. After enlisting in the Corps of Royal Engineers in 1983, he trained as a mechanical engineer and military diving supervisor and saw active service in Iraq, Bosnia, Kosovo, Northern Ireland, and Afghanistan. Wotherspoon enlisted in the Australian Defence Force in January 2007, where he served as a development officer in the Special Operations Command (SOCOMD). During this period, he project-managed a number of technically challenging projects. He ended his military career in January 2010 before joining the expeditionon loan. He was born in Oban, Scotland, in 1967. David Apperley brought a wealth of experience to the DEEPSEA CHALLENGE project, both as a commercial diver and an electrical engineer. He worked on the submersible’s thruster systems and was a support diver on the expedition’s vehicle Launch and Recovery Team. He lives in Brooklyn, New South Wales, Australia. An avid cave diver, he was hired as an underwater double for the feature film Sanctum. Along with John Garvin, he helped support Tanya Streeter in her 2003 world record dive attempt in the Caribbean. Apperley shares James Cameron’s passion for sustainability. Since the DSC expedition, he has focused his attention on renewable energies. He is currently completing a degree in engineering in renewable energy technologies. Australian Joseph Barkoczy joined the DEEPSEA CHALLENGE project as an electronics engineer to work on the submersible’s lighting system. He also worked to design and build the interior wiring inside the submersible’s pilot sphere, a complex task considering the number of different systems involved. Barkoczy has a background in avionics, and has worked on everything from light aircraft to jumbo jets for several companies, including Qantas, AEA, and Garmin. He also built and flies his own helicopter. Barkoczy is a skilled musician and designs and builds high-end speaker systems and amplifiers for professional musicians. He finds that music provides him with inspiration. Peter Batson was a science coordinator for the DEEPSEA CHALLENGE expedition. His role was to facilitate the expedition’s science program in cooperation with participating scientists and the wider oceanographic community. He has an M.Sc. in marine science from the Department of Marine Science at New Zealand’s University of Otago, where he studied lace corals on the edge of the continental shelf. From 2005, he worked as a marine researcher and more recently he has been involved in the education and ecological research areas. Batson feels very privileged to have been a part of DEEPSEA CHALLENGE, a remarkable exploration project that brings important new scientific insights, understanding, and appreciation to the world’s most inaccessible ecosystem. For more than ten years, Nic Bingham has pursued a career in practical research, working on personal and professional projects as diverse as inkjet-printed electronics, control systems for industrial robotics and rapid-prototyping machines, the world’s biggest battery-powered sound and light show, and autonomous solar-diesel power plants operating at the summits of the Antarctic plateau. He began designing the power distribution system and vehicle control network for DEEPSEA CHALLENGER in 2010, and later developed the pressure-tolerant motor controller used to drive all thrusters and hydraulic pumps on the vehicle. An inventor and author of several Australian and U.S. patents, Bingham continues to design, build, and deploy specialized equipment to support ocean exploration and astronomical research. Currently an adjunct lecturer at the University of New South Wales, Australia, he is also an advocate for science education and resource conservation, believing these two areas to be closely linked. Ty Boyce is a vice president, principal, and founder at Edge Innovations. Edge was responsible for the detailed design, development, and fabrication of the lower pod section of DEEPSEA CHALLENGER. After integration and testing, Boyce continued on with the expedition phase of the project and supported sub operations at sea. Boyce studied electrical and mechanical engineering at Stanford University and joined the product design and development firm IDEO after graduating. At IDEO he worked on products and systems for clients such as Apple, HP, Next, and Xerox. He first worked with James Cameron on The Abyss, where he was responsible for the electrical systems on the remote-controlled models of the Cab and Flatbed submersibles. Boyce worked for Walt Conti on The Abyss and joined him when he founded Edge Innovations in 1991. Edge has worked on scores of groundbreaking robotics, many of which have intrigued and entertained audiences across the world, for clients such as Universal Studios, Disney, Warner Brothers, Steve Wynn, and Frank Gehry. He thanks James Cameron for the opportunity to be a part of such a historic endeavor, for his leadership, and for the trust he placed in all members of the team. Finally, he sincerely appreciates all involved in this bold and Herculean effort but especially wants to thank the Edge team for their amazing work and dedication. Robert “Bruno” Brunelle is a systems engineer in Cameron | Pace Group, the world’s leading producer of 3-D imaging technology. 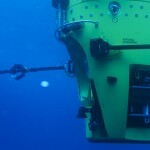 During the DEEPSEA CHALLENGE expedition, Brunelle’s role was to maintain the 3-D cameras mounted on the submersible and twin lander vehicles. Dividing his time between Burbank and Toronto, Brunelle has worked on creating the 3-D systems for many major films, including Cameron’s Avatar and Titanic Live. Canadian Tim Bulman is an electrical engineer, commercial diver, and submersible pilot. Bulman was part of the design and build team for the entire sub, then focused on integration and operations of its acoustic communication system. He worked previously with Cameron on Aliens of the Deep, Cameron’s multiple Deep Rover expeditions, the Titanic Live 2005 expedition, and, throughout his career, with most of the other submersibles currently operating. The people involved with the DEEPSEA CHALLENGE expedition have motivated him to strive harder to reach goals, and more importantly to do things in a way that educates and motivates kids in science and technology. Bulman, married with two children, operates Indepth Marine, an underwater consulting firm on Vancouver Island. He is currently working onboard the yacht Octopus with their underwater vehicles and is working on an expedition to locate a Gold Rush-era shipwreck in Lake Laberge, Yukon. Ray Commins is an electronic technician with L-3 Nautronix, where he has worked as a field service engineer since 1994, mostly in the oil and gas industry. His work has taken him around the world (Malaysia, Brunei, Myanmar, India, South Africa, Equatorial Guinea, Nigeria, Brazil, Gulf of Mexico, and the North Sea). Prior to that, he worked on sailing ships and motor yachts for four years as a mate, conducting adventure cruises in the southwest Pacific and Southern Australia. He lives in Busselton, Western Australia. Walt Conti is the founder and CEO of Edge Innovations. In 1986 Conti created the world’s first realistic, free-swimming robotic whales for Star Trek IV. Since then, Walt and his team have been creating one-of-a-kind robotic systems for the film, theme park, and subsea industries. Edge’s aquatic animals have been instrumental to such films as Free Willy, Anaconda, Deep Blue Sea, and The Perfect Storm, for which Conti received an Academy Award nomination. Conti’s underwater ties to James Cameron go all the way back to The Abyss, for which Conti helped create one-quarter-scale submersible models. For the DEEPSEA CHALLENGER, he oversaw the design and creation of the lower pod portion of the submersible. Prior to founding Edge, Conti worked at the renowned design consultancy IDEO and George Lucas’s ILM. Conti graduated Phi Beta Kappa from Stanford University, receiving a B.S. and M.S. in engineering. Edge is currently designing key systems for the next-generation, full-ocean-depth ROV being developed by WHOI for the Schmidt Ocean Institute. These systems are based directly on the innovative technologies that came out of the DEEPSEA CHALLENGE program. Nicolas Corkill was a safety diver for the DEEPSEA CHALLENGE. His work onboard was primarily with the in-water safe launch and recovery of the submersible. He is a commercial diver who left Australia after two years of working and traveling there. Previously he served in the Royal Navy for six years and was later a deckhand on a super yacht, a PADI dive instructor, and an underwater videographer. Originally from Greater London, Nick has traveled and worked extensively throughout Europe, Africa, and Asia. John Garvin, Sphere internal life-support manager, has been diving since 1990 and is recognized as one of the world’s leading technical diving instructors. After years of teaching diving in the U.K., Garvin moved to the Turks and Caicos Islands, where he set up and ran his own technical diving facility and ran rebreather expeditions to the world’s most remote and exciting dive sites, including the Galápagos, Bikini, and Chuuk Lagoon. Garvin founded the Caicos Caves Project, a team of experienced cave divers dedicated to exploring the incredible underwater cave systems beneath the islands. He is also a qualified recompression-chamber safety officer. In 2003 Garvin provided the logistics and safety diver support for Tanya Streeter’s world-record-breaking free dive to 540 feet (160 meters). In 2010 Garvin worked as dive coordinator and underwater stunt consultant for the 2011 action-adventure film Sanctum. In addition to writing the screenplay, he trained the actors and stunt divers to dive rebreathers and was also featured as a stunt diver and actor in the film. While finishing a Ph.D. in underwater robotics in late 2010, Gobi found himself visiting Sydney University for collaborative research. He caught wind that James Cameron was forming a small group of engineers to build a submarine for deep-ocean exploration, a project he very much wanted to join. With a recommendation from the Australian Centre for Field Robotics, Gobi signed on to the Acheron Project with the responsibility of creating the 2-D and 3-D full-ocean-depth camera systems for DEEPSEA CHALLENGER and her support vehicles. He joined the expedition aboard the Mermaid Sapphire, where he provided critical engineering support to ensure that his cameras continued to capture 3-D imagery of the deepest parts of the Earth. Following this incredible experience, he was inspired to return home to Newfoundland and form SULUS Subsea Corp. (www.sulissubsea.com), an organization dedicated to the development of the next generation of underwater robotics and deep-sea imaging systems. The company strives to uphold the ideals of the DSC program, aiding other organizations as they continue their exploratory efforts into the deep. David Goldie is an experienced mechanical engineer. Driven by his love of the ocean and extreme challenges, Goldie was an obvious fit for this expedition. He has worked for several years in the Australian film industry in the special effects departments of such movies as The Matrix and its sequels. He has been tinkering in various workshops from a young age and has a reputation for being able to work in many different materials and provide prompt and innovative solutions to a wide array of mechanical engineering problems. Recently he has designed and built kite-powered sleds and tested them in the Canadian Arctic and created a self-propelled burrowing robot worm. Since the expedition ended in March 2012 he has spent time developing a miniature water desalinator and various special effects film jobs. He has been kite-ski touring the Australian Alps and resurrecting old climbing routes on the Sydney sea cliffs. He was also the life support engineer for Dr. Glen and Heather Singleman’s altitude world-record wing suit jump attempt in July 2013. This involved integrating oxygen systems into their wing suits for a jump from 39,000 feet (11, 900 meters). Goldie has received no formal education since the age of 16. Queenslander Ben Grant was an electronics specialist on the DEEPSEA CHALLENGE project. He spent eight years in the Australian Navy working as an electronics technician. During this time he served aboard the H.M.A.S. Leeuwin, H.M.A.S. Brunei, and H.M.A.S. Kanimbla in a variety of roles. This included peacekeeping duties in the Solomon Islands in 2005. Grant left the navy in 2010 to work for defense contractor Raytheon on the Australian Air Warfare Destroyer project and joined DEEPSEA CHALLENGE in June 2011 as an electronics technician. He worked on many of the submersible’s systems, including the thrusters, external wiring, 3-D camera systems, and battery management system, as well as acoustic communications. Australian Nic Hannekum joined the DEEPSEA CHALLENGE project as an electrical engineer and core member of the research and development team, instrumental in the development of the submersible’s powerful LED arrays, battery management system (BMS), and 3D-HD camera pan-and-tilt control system, as well as two deep-sea landers. With some experience in sailing, Hannekum also played a role in the launch and recovery of DSC on each dive. Hannekum has worked in the electronics engineering departments of Charles Darwin University and the University of Newcastle, and in private enterprise. Since the DSC expedition, Hannekum has worked with Woods Hole Oceanographic Institution developing new HTROVs and is currently engaged with Schmidt Oceanographic Institute developing next-generation, full-ocean-depth HROVs. Australian James Kennedy was a battery specialist on DEEPSEA CHALLENGER’s battery management system (BMS). He joined the project for a day’s work in November and ended up staying. Since then Kennedy’s involvement expanded to include manufacture and maintenance of the submersible’s and landers’ hundred-plus battery modules, as well as consulting on the thruster control system. Kennedy graduated with a bachelor of engineering from the University of Queensland, where he became involved with the Sunshark solar-powered racing car team. This experience led to the formation of Kennedy’s company Tritium, which specializes in high-power electronics and battery management for electric vehicles. Australian Luis Marmolejo was the lead control engineer for the project. He designed, procured, and programmed the DEEPSEA CHALLENGER’s control system and instrumentation, which enables the pilot to command the submersible’s many individual devices and systems, and displays, records, and transmits all vital information. Trained as an electrical engineer, he holds a B.Sc. in electronics and communications and a master’s in computing. He has specialized in industrial equipment and systems design for many years. Marmolejo has worked in six countries on a wide variety of projects, including seabed drill rigs, oil exploration, intelligent transport systems, steel mills, and IBM. Since the expedition, Marmolejo has participated in the design and construction of the world’s first 1 MW Ocean Wave Energy Converter, managing the electrical and control areas. “DSC was an incredible opportunity to work on a challenging project with a unique cast of characters united in the common goal of opening the way to the most difficult place to reach on Earth,” he says. Ben Orchard works for Opto 22, a California company that created the hardware and software for the computer control system on the DEEPSEA CHALLENGER. Born and bred in Australia, Orchard moved his family from Ballarat, Victoria, to Temecula, California, four years ago to work for Opto 22. Prior to that, he spent 18 years working as an engineer for the Ballarat Base Hospital. Orchard was part of the sub internal team. Since the automation controller controls and monitors almost every system on the submarine, he was involved in almost every aspect of the electronics and computer systems. He was also a member of the hatch team, responsible for closing and opening the hatch at the start and end of every dive. Since the end of the expedition, Orchard has worked with team member John Garvin on an extensive pilot manual for the DEEPSEA CHALLENGER to ensure that the technical aspects of the sub’s systems are available for future deep-sea explorers. Palandjian’s role on the expedition was to drive and repair the expedition’s support craft—the 30-foot (9-meter) Prime RHIB and several Zodiacs. Born and raised in Newport, Rhode Island, Palandjian moved to Los Angeles in 1984. He has been a mechanic since the age of 13, when while spending time at his father’s shop, he learned how to turn a wrench. He started racing cars, then bikes, and eventually offshore boats. DEEPSEA CHALLENGE was Palandjian’s second expedition with James Cameron—he also participated in the 2005 expedition to the Titanic wreck to film Last Mysteries of the Titanic. Paul Roberts is a computer systems engineer and project manager at L-3 Oceania, with over 25 years of experience in delivering leading-edge engineering projects. Roberts grew up in England, building electronic systems and designing computers, which won him awards from Young Engineer for Britain and European Young Scientist. Roberts attained his B.Sc. (Eng) Hons. from King’s College London, and immigrated to Australia in 1995. Since joining L-3 Oceania, Roberts has led the successful development of several innovative underwater communications and positioning systems, including portable torpedo tracking for the U.S. Navy and deep-water wireless controls for the oil and gas industry. Roberts led the development of the DEEPSEA CHALLENGE acoustic communications systems at L-3 and was responsible for integrating the acoustic systems onto the submarine and landers before joining the expedition to operate and maintain the communications. Many months of hard work paid off on March 26, 2012, when James Cameron’s voice came through loud and clear from the seafloor of the Challenger Deep. Since the expedition, Roberts’s team have launched their long-range acoustic modems as a product and won the 2012 West Australian Industry and Export Award (Information Communication Technology). He lives in Perth, West Australia, with his wife, Michele, and their sons, Henry, Eliot, and James. Richard Robles has supported James Cameron on seven previous deep-ocean expeditions. Specializing in launch and recovery and amphibious support, he has played critical roles in operations at sea, among them the return to Titanic chronicled in Ghosts of the Abyss and the exploration of hydrothermal vent sites featured in Aliens of the Deep. A Gulf War veteran and former member of the 15th Marine Expeditionary Unit, Robles has a background in special operations and degrees in computer science and criminal justice. On the DEEPSEA CHALLENGE, Rich functioned as coxswain, among other roles, in expedition logistics, operations, and support. San Diegan Bruce Sutphen was the U.S. project manager for the DEEPSEA CHALLENGE build. His extensive seagoing experience also made him a valuable member of the expedition team; he was part of the Sub Team, Lander Team, and Launch and Recovery Team. A physicist by education, Sutphen has 25 years in scaled modeling and project-management experience associated with Grand Prix Yachting (including Circumnavigation and America’s Cup campaigns). He has also worked on U.S. military and subsea robotics programs. An experienced sailor, his DEEPSEA CHALLENGE responsibilities ranged from running the scaled-model launch and retrieval and vehicle dynamic-stability testing, to managing the U.S. composite and lower-pod robotics fabrication for the DEEPSEA CHALLENGE. Charlie Arneson has more than 20 years of professional experience in marine sciences. He co-developed two marine research facilities in Micronesia and has authored and co-authored more than 30 scientific papers and popular articles, as well as participated in more than 40 scientific and photographic cruises. He has used submersibles for scientific studies and made a ten-day saturation dive in an underwater habitat. He is currently involved with a dive operation in Micronesia, a reforestation project in Panama, and sustainable living projects near Santa Barbara, California. Charlie was general manager and vice president of the Twentieth Century Fox film studio in Rosarito, Mexico, where he also developed and managed Foxploration, a cinema theme park. He consults for film studio construction and management projects in the U.S. and numerous other countries. John Bruno is an Academy Award winner and six-time Oscar nominee in the field of visual effects. One of the most acclaimed visual effects artists in Hollywood, Bruno won the Academy Award for his work on The Abyss and was nominated for his visual effects work on Ghostbusters, Poltergeist II, Batman Returns, Cliffhanger, and True Lies. He has most recently served as visual effects supervisor on Twilight: Breaking Dawn, Avatar, Rush Hour 3, X-Men: The Last Stand, and Alien vs. Predator, and was 3-D consultant on Monsters vs Aliens. Bruno was part of the team that established DIGITAL DOMAIN, serving as visual effects supervisor on True Lies. In 1995, Bruno spent five months in the preproduction phase of Titanic as visual effects supervisor (making the first of four dives to the famous ship) before directing Virus, starring Jamie Lee Curtis and Donald Sutherland, in 1996. Prior to this, he designed the visual effects for James Cameron’s Terminator II and codirected T2 3-D: Battle Across Time with Cameron. Bruno received the Belding Award (in advertising) for his short theatrical film The Run. Expedition journalist Joe MacInnis is a physician-scientist, writer, and deep-sea explorer who studies leadership in high-risk environments. He has led ten research expeditions under the ice of the Arctic Ocean, worked with marine scientists two miles (three kilometers) under the Atlantic and Pacific Oceans, and spent time with astronauts who built the International Space Station. Supported by the Canadian Forces, he recently spent time in Afghanistan interviewing soldiers and airmen fighting the Taliban. MacInnis has written ten books, including the companion books to James Cameron’s last two deep-sea expeditions. On the DEEPSEA CHALLENGE expedition, MacInnis was the backup medical doctor and electronic journalist. He kept a daily log and took video and still photographs of the action, posting content to the expedition website in conjunction with National Geographic. (For more, visit www.drjoemacinnis.com.) Last year, Random House published his latest book, Deep Leadership: Essential Insights from High-Risk Environments. MacInnis is currently giving keynote presentations and workshops on leadership to universities and corporations, working on a leadership project with Canada’s Special Forces, and working with James Cameron on Cameron’s expedition book. Expedition doctor and second unit director Glenn Singleman is a medical doctor who has worked in emergency and intensive care medicine for 20 years. He also has a communications diploma in film and television and postgraduate qualifications in underwater medicine and parachute systems technology. As a doctor, Singleman has accompanied extreme-environment expeditions to Antarctica, the Himalaya, the Karakorum, and the Andes, and has traveled to the wreck of the Titanic in the Mir 1 submersible. He has made four documentary films for National Geographic television and obtained numerous world records in extreme sport. His best known world record is for the highest wing suit BASE jump in the world—with his wife, Heather—from 21,667 feet (6,604 meters) off Mount Meru in the Garwhal Himalaya in India in 2006. Singleman continues to build on his extensive experience as a remote-medicine specialist, including serving as a doctor for the Big Red Run—a 150-mile (240-kilomter) ultramarathon through Australia’s Simpson Desert to raise money for diabetes research. Maria Wilhelm works with James Cameron on a wide array of projects. The president of the corporate development group for the CAMERON companies and executive director of the Avatar Alliance Foundation, she’s supported the expedition through media and commercial partnerships with primary collaborators National Geographic and Rolex. Wilhelm has been involved in the structure and strategic growth of the CAMERON | PACE Group, a 3-D technologies and services company, in social advocacy with a focus on climate change, and in creative endeavors associated with the movie Avatar. A trustee of the African Wildlife Foundation and a member of the Explorers Club, she has found herself at the bottom of Lake Baikal in a Russian Mir submersible, sleeping in a Kayapo village 14 hours up the Xingu River in the Brazilian Amazon, and dunking in the Ganges during the Kumbh Mela in Haridwar—all in a day’s work in the fascinating territory she calls Cameronland. Professor Douglas Bartlett, chief scientist and microbiologist, has extensive experience studying the nature of microbial life in deep-ocean trenches and other deep-sea settings. His research group pioneered genetic studies of these alien-like microbes and was the first to identify genes regulated by pressures of thousands of pounds per square inch and genes that are required for high-pressure growth. Bartlett earned his Ph.D. in prokaryotic molecular biology from the University of Illinois, was a research scientist at the Agouron Institute, and later assumed a faculty position at Scripps Institution of Oceanography, University of California, San Diego, where he now holds the rank of professor. Since returning from the expedition, Bartlett has participated in cruises to the Tonga Trench and the San Clemente Basin and has lectured on the DEEPSEA CHALLENGE expedition at scientific symposia in the United States, Europe, and Asia, as well as to students and general audiences via webinar, grade-school assemblies, and public presentations. Much of his time has been devoted to analyzing the microbiological samples returned from the expedition. Roger Chastain is currently a staff research associate at Scripps Institution of Oceanography. He has over 25 years’ experience isolating, culturing, and studying the physiology of marine microorganisms, especially those collected from the severe environments of the deep sea. His research has addressed both the upper temperature and upper pressure limits of life. He has also studied the effects of decompression of deep-trench bacteria with regard to their survival, morphology, and structural integrity, demonstrating the unique adaptations of these life-forms to biophysical conditions distinct from the surface of Earth. Chastain has a great deal of technical expertise maintaining equipment that must be operated at hydrostatic pressures mimicking deep-sea conditions and in collecting deep-sea samples using autonomous landers. Geologist Patricia Fryer, Ph.D., is interested in tectonic-plate subduction, the process that forms ocean trenches and island arcs. She is a veteran of 45 marine research expeditions, often in the role of chief scientist, and her research has focused on the very deepest parts of the Mariana Trench, including the question of why the Challenger Deep is so deep. She also has an active interest in serpentine mud volcanoes formed as a consequence of the subduction in the Mariana Trench. A keen proponent of piloted submersibles, Fryer has dived in the human-occupied vehicles (HOVs) Alvin and Shinkai 6500, and has conducted expeditions with remotely operated vehicles (ROVs). She received her college degree in geology from the College of William and Mary, and her graduate degrees in geology and geophysics from the University of Hawaii. Since the DEEPSEA CHALLENGE expedition, Fryer has been busy resolving the complex tectonic history of the Mariana Trench region. She is also working with Kevin Hand, Ph.D., and Doug Bartlett, Ph.D., to understand the biological implications of microbial communities observed thriving on serpentinized peridotite in the Sirena Deep. Fryer is part of a consortium of scientists planning the first National Forum on Ocean Exploration, which is committed to establishing and enabling new partnerships, investments, technology development, and expeditions to explore the world’s oceans. Astrobiologist Kevin P. Hand, Ph.D., is deputy chief scientist for solar system exploration at NASA’s Jet Propulsion Laboratory in Pasadena, California. His research focuses on the origin, evolution, and distribution of life in the solar system, with an emphasis on Jupiter’s second large moon, Europa. His work involves both theoretical and laboratory research on the physics and chemistry of icy moons in the outer solar system and has taken him to the Dry Valleys of Antarctica, the depths of the Earth’s oceans, and the glaciers of Kilimanjaro. In 2011 he was selected as a National Geographic emerging explorer. Hand earned his Ph.D. from Stanford University and bachelor’s degrees from Dartmouth College. He was born and raised in Manchester, Vermont. As part of the DEEPSEA CHALLENGE expedition, Hand focused on sampling sediments for deep-ocean organic walled foraminifera. On the last lander drop of the expedition in the Mariana Trench’s Sirena Deep, cameras captured a unique microbial community thriving on the surface of serpentinized peridotite. Using various spectroscopic methods to analyze and identify the sediment recovered from the site, Hand is working to link life in this extreme environment to the origin of life on Earth and other planets and Europa. Dr. Christina Massell Symons received her Ph.D. in earth sciences in 2002 from Scripps Institution of Oceanography. She logged 200-plus days at sea onboard research vessels and two days below sea level in DSV Alvin and DSRV Avalon, mapping the seafloor along the rim of the Pacific Ocean Basin. Symons’ primary focus was investigating the subducting plate at the Peru-Chile Trench, the Tonga-Kermadec Trench, and the Aleutian Trench. Her exploration of trenches supported her effort to unravel the complex tectonic history of the Pacific Basin. Following completion of post-doctoral research, Symons worked on a National Science Digital Library collection, a collaborative effort among Scripps scientists, librarians, educators, and data managers to create a digital library environment for earth science education. As a science spokeswoman, she is eager to share her enthusiasm for exploration of our planet in hopes of inspiring future scientists, educators, and leaders. Dr. Erika Montague is an ocean technologist with a fascination for the wonders of the deep sea. Entranced by bioluminescence and exploration, she earned a Ph.D. in oceanography from Johns Hopkins University. Joining expeditions to remote locations and diving aboard deep-diving submersibles, Montague realized that to better understand the deep-sea ecosystem would require access to instruments that did not yet exist, so she set about developing skills in marine engineering. While at Harbor Branch Oceanographic Institution and Monterey Bay Aquarium Research Institute, she helped develop a low-light, deep-sea observatory and undersea lander vehicles and invented an autonomous tissue sampler for collection of DNA from deep-sea fishes. Montague now serves as the director of science and technology at OceanGate Inc. She is also a submersible pilot and consultant on several ocean exploration projects. During the DEEPSEA CHALLENGE expedition, Montague worked with the lander and submersible teams, helping to maintain and deploy scientific instruments and sampling devices. Montague was honored to be part of this expedition, which she believes will ignite the passion of exploration in generations to come. Kevin Hardy directed the design, construction, and operation of unmanned landers for the DEEPSEA CHALLENGE expedition. In grade school, Hardy was inspired by the imaginative and bold ocean engineering projects of the time, including the U.S. Navy’s SeaLab and bathyscaphe Trieste projects and the French Conshelf habitats and bathyscaphe Archimede. He landed a job at Scripps Institution in 1972, while working on a B.S. in engineering from San Diego State University. At Scripps, he designed and built sensors and samplers for marine scientists and deployed them around the world. He has participated in more than 150 research expeditions. He retired from Scripps in 2011 but remains active in the deep-sea community. Hardy’s unmanned landers have made the round-trip to the floor of the Kermadec, Tonga, Aleutian, Puerto Rico, New Britain, and Mariana Trenches. American Larry Herbst designed and operated the DEEPSEA CHALLENGER‘s deep-diving lander’s still-imaging system to capture photos of the submersible and life-forms on the ocean floor. He first met James Cameron in 1986 and has worked on a number of Cameron projects, including the 3-D IMAX film Aliens of the Deep, for which he created 3-D time-lapse sequences. Herbst holds a bachelor of electrical engineering from Brown University and an M.F.A. in film from USC. He is a filmmaker with a deep interest in cutting-edge technology and has worked for many years with the XPRIZE Foundation, whose competitions are the subject of his latest documentaries. Robby Seid is a self-taught engineer who helped to build and operated DEEPSEA CHALLENGE’s lander vehicles. Seid had just returned from his summer job—commercially fishing for salmon in Bristol Bay, Alaska—when he met engineer Kevin Hardy at a UCSD function. Hardy had recently commenced building the landers and recognized Seid’s potential to assist with the project. Three weeks later Seid was building deep-sea landers for James Cameron, and several months after that he found himself on the DEEPSEA CHALLENGE expedition. He has a B.A. in environmental studies from UCSC. When not at work Seid loves to travel. Born in Edinburgh, Scotland, Cameron has worked on the Mermaid Sapphire since it was delivered to Thailand in 2009. His ROV background spans 25 years, and he has worked on many oil and gas projects, including liquid cargo salvage, subsea construction, remote intervention, survey, and inspection. Cameron’s official title is offshore construction manager (OCM), the senior offshore project representative for Mermaid Offshore Services. On the DEEPSEA CHALLENGE expedition, Cameron was responsible for ROV team operations, integration of ancillary equipment to the ROV, assisting in the launch and recovery of the DEEPSEA CHALLENGER, the science landers, the surface support craft, and operations on deck. Gavin Cole is a remotely operated vehicle supervisor from Daviot in the northeast of Scotland. Cole completed an H.N.D. in electronic engineering at Aberdeen College in 2004 to pursue a career in the ROV industry. For the past ten years, he has worked in the offshore oil and gas sector, first as a subsea acoustics engineer before moving into his intended field. Aboard the Mermaid Sapphire, Cole was responsible for the maintenance and operations of the Quasar ROV system. His involvement in the DEEPSEA CHALLENGE project was ROV support to 2,000 meters (a mere 9 kilometers shallower than the big green sub) and as part of the submersible Launch and Recovery Team. Cole is currently involved in subsea construction/survey operations near Matak Island, Indonesia. As an avid traveler who has always been fascinated by the sea, he was more than thrilled to be part of such a historic expedition. Working with National Geographic and James Cameron, meeting Captain Don Walsh, being part of history, acquiring new friends, and having a few wee drams after a shift … Well, it wasn’t a bad few months. Colin Flagg served eight years in the British Merchant Navy before becoming a remote operated vehicle technician in the oil and gas industry. His ROV work took him to the Philippines in 2007, where he continued to work and live until being posted on the DEEPSEA CHALLENGE project and the ROV Quasar. ROV Quasar provides dive support down to depths of almost 6,560 feet (2,000 meters). The ROV team also played a leading role in the launch and recovery of DEEPSEA CHALLENGER submersible from the Mermaid Sapphire. Stuart Buckle has been at sea since he was 17 years old. He completed his officer cadetship with Shell working on oil and gas tankers. In 2000 he moved into the specialist dynamic positioning (DP) sector of the industry, working on pipe lay, well stimulation, subsea construction, and dive support vessels. In 2010 he obtained his masters unlimited certificate of competency. This allows him to captain any vessel, anywhere in the world. At the time of the DSC expedition, Buckle had been captain (or “master” as it’s also known) of the Mermaid Sapphire for just over a year. The captain is in charge of the ship and responsible for all the people on her at all times. With that power (and nice cabin) comes great responsibility. His priorities are always for the safety of his crew, the safety of his ship, and the protection of the environment. Buckle lives in Glasgow, Scotland, with his wife, Juliana. 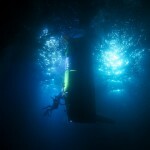 He has left the Mermaid Sapphire and is now captain of a diving support vessel working in the Gulf of Mexico. Born in Cardiff, Wales, in 1959 and married to the lovely Kim, Stephen Blow has four sons, six grandchildren, and a shih tzu. He is a passionate supporter of the Cardiff City Football Club and enjoys bird-watching and moderately long walks. He joined the Merchant Navy in 1978, serving as motorman, AB, and pumpman. He gained his crane operator’s certification and moved to the offshore industry seven years ago. He had the task of launching and recovering the submersible with the crane in partnership with the rest of the team operating various winches and tag lines. He found the job initially daunting due to the high profile of the project, but after many practice drills and much discussion, and with several successful dives under their belts, he now has great faith and confidence in the whole operation and the personnel involved. Brian Conner graduated from South Tyneside College in June 2000. After serving on oil tankers, he moved into the offshore industry in 2004. The majority of his seatime has been spent in the North Sea on offshore supply and construction vessels. Originally from Newcastle, he now lives in Spain with his wife, Laurina, and daughters Anna and Amy. On the Mermaid Sapphire Conner was responsible for the dynamic positioning of the vessel, and as safety officer, he was responsible for the maintenance of safety equipment and the implementation of safe working practices onboard. Project executive Melanie Chryssochoides was born in Bondi Beach, Sydney, and comes to the project with a varied background. Prior to her media career, Chryssochoides lived in southern California working with “youth at risk” through the Y and DARE programs—a hard but very rewarding role. With ten years in feature film production and a lifetime with two engineers in the family, Chryssochoides was well equipped to support her complex and demanding role in DEEPSEA CHALLENGE. A producer herself, Chryssochoides has her own film and television production company in Melbourne, which focuses on TV commercials and feature film development. As an aspiring film producer, Michael Horvath joined the film industry in 2006, after completing a diploma in film production at Sydney Film School. Since then, Horvath has worked in various production roles on over 21 feature and television projects around Australia, including such films as Paradise Lost, X-Men Origins: Wolverine, Australia, Happy Feet 2, Tomorrow, When the War Began, and many more. Having joined DEEPSEA CHALLENGE at the end of 2011, Horvath provided the expedition with logistical support in personnel movement, coordinating travel, freight, and parts purchasing. Dianna Bisset has been designing and making equipment using technical fabrics and webbing for the outdoor industry since the early 1980s. She now works for Wild Stuff/Tufftec in Australia as a specialist designer of harnesses for flying performers in theater and films, as well as for rescue, sport, and industrial applications. Spectacular events such as the opening ceremony of the 2000 Sydney Olympics depended on Bisset’s harnesses for the myriad flying effects. For the DEEPSEA CHALLENGER Bisset designed and made the harness and tensioning straps for lifting, locating, and holding the sphere into the beam; the internal lifting slings; and lift, launch, and towing bridles. Since the end of the expedition, she and her husband Warwick have opened Rocklily Wombats, a wildlife refuge that rehabilitates and releases animals, including wombats, wallabies, and kangaroos. “Having the sub dive on a harness and strapping system I helped create was truly amazing and the highlight of my career,” says Bisset. David Bleads is a mechanical engineer who began his working career as a toolmaker. He worked at UTS and Macquarie University assisting scientists with the mechanical development of several projects, including the early laser devices. Later he started a business in prototype engineering, where he worked on a range of projects, often for R&D and start-up companies, designing and making a diverse range of devices, from medical probes to sonar buoys. On the Acheron project, he was involved in the thruster collaboration with the electronics engineers; the high-pressure-resistant strobes; the sphere-hatch viewport mount for the Red Epic camera; the mounting systems and parts for the cameras inside and outside the sphere; the soft buoyancy system; the fiber-optic penetrator for the data cable from the sphere to the externals; and sample gathering equipment. Stephen Davison joined the DEEPSEA CHALLENGE build project for three months at a busy time for the electronics design team. He drafted PCBs for the thruster, power distribution system, and camera system. Irish born, Davison has had an eclectic career, studying at Cambridge University, researching optical fibers and mobile phone systems, designing optical/electronic communications products, learning Arabic and teaching engineering in Jordan, and doing a stint as a trainee patent attorney. Davison loves being an engineer at all stages, from research and modeling to fabrication and testing. He has now returned to communications electronics. Managing director of Finite Elements Australia, Phil Durbin was the principal mechanical and structural engineering advisor to James Cameron, Ron Allum, and the Acheron team for six years. Durbin’s three decades of design development experience is evident in nearly every aspect of the DEEPSEA CHALLENGER’s design and construction. He says, “This project has been as much an expedition to the frontiers of engineering as the journey to the trench itself.” One of Durbin’s major achievements was co-inventing, with Allum, the primary material of construction, the ISOFLOAT™ syntactic foam. Another early project milestone saw Durbin and his team design and test to full depth the sphere, acrylic view port, and hatches. Robert Fuhrmann is an experienced electromechanical systems engineer from the Pacific Northwest. Edge Innovations brought him onboard to assist the lower-pod team on the electrical system, science instrument, and mechanical integration. He has supported science at the Monterey Bay Aquarium Research Institute, Woods Hole Oceanographic Institute, South Pole Station, and Institute of Ocean Sciences. Besides having a passion for building and fixing things, especially in the name of science, he enjoys wandering and climbing in the mountains. In June 2011 Neil McLennan joined the Acheron Project to provide the management framework while it was still in its conceptual stages, assisting Ron Allum with managing the company. Over the next two and a half years McLennan’s role was to find the staff, set up the information systems, develop the budget, lease and purchase materials for the sub, create patents and trademarks, and generate the legal framework for the organization. Additionally, McLennan managed the project while Allum solved the technical challenges. McLennan originally trained with Price Waterhouse in 1980 after leaving school, and he has a B.Com from UNSW. Previously McLennan was CFO/company secretary for Immune System Therapeutics Ltd. What distinguished this project was the complete digitization of the workflow from the design process using CAD to the Google Apps communication, SQL inventory management, and banking. This led to a centralization of information and facilitated sharing of information in the organization. Having learned to dive at age 11, Lynn Micheletti became a diving instructor while studying at university. She graduated from UNSW with a bachelor’s degree in 1994. Diving led her to a career in the marine industry. During the past 18 years, she has skippered, crewed, and worked as a commercial diver on projects and films around Australia and overseas. Micheletti holds a master class 5, MED2, and commercial diving certification. She joined the Quest dive team in 1999 under the expedition leadership of Andrew Wight. She also held the position of divemaster on Paul Allen’s superyacht Octopus. She joined DEEPSEA CHALLENGE in June 2010 and continued Ron Allum’s work on the small-scale manufacture of full-ocean-depth syntactic foam. Working closely with contractors, Micheletti managed everything that involved the production and use of syntactic foam. Brad Major has worked in the film and television industry since 2009, producing shows for Fox Sports One (for Australia’s Cable Channel Foxtel). Ronan’s Escape, Major’s first professional short film, won nine awards and received three honorable mentions in 21 international festivals. Brought on to DEEPSEA CHALLENGE 3-D as a production manager, Major coordinated the documentary team across three different states in Australia and four countries. Since wrapping on DEEPSEA CHALLENGE, Major has won script-writing awards and has continued to collaborate on projects as both a writer and co-producer, as well as working closely with Murdoch University and MAP4U in Western Australia to establish the Creative Arts Initiative (CAI), a program that encourages media high school students to follow their dreams, with great success.